Transform your table into a winter wonderland with our Chocolate Cream Ornament Cake. Plus, our Chocolate Cream Ornament Cake is as tasty as it is cute. Prepare cake batter and bake as directed on package for 2 (9-inch) round cake layers, blending dry pudding mix into batter before pouring into prepared pans. Cool cakes in pans 10 min. ; remove to wire racks. Cool completely. Beat cream cheese and powdered sugar in large bowl with mixer until blended. Gently stir in COOL WHIP. Stack cake layers on plate, spreading 1/3 of the cream cheese mixture between layers. Frost top and side of cake with remaining cream cheese mixture. Poke 2 small holes in bottom of ice cream cone; insert ends of licorice into holes, leaving small loop at top. Place next to cake to resemble ornament hanger. 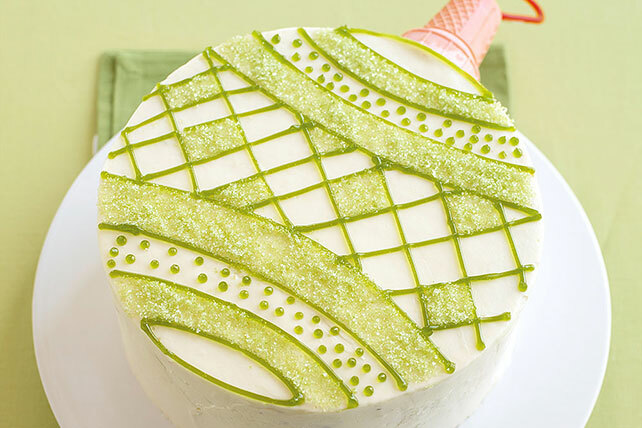 Decorate cake with decorating gel and colored sugar as desired. You'll know it's a special occasion when you get to enjoy a serving of this festive cake. For fun and easy patterns, place cookie cutters on top of cake and fill in shapes with the colored sugar.